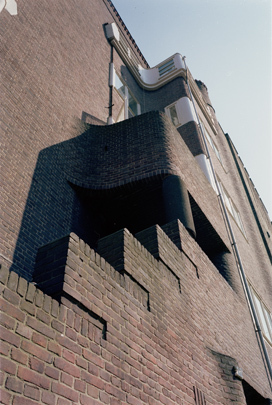 Just the facade of this privately built housing block in Amsterdam-Zuid was designed by Margaret Staal-Kropholler. Its relatively smooth, taut surface displays at the corners, and where streets meet it at right angles, the curves and sculptural accents characteristic of the Amsterdam School. These undulations incorporate balconies and entrances, occasionally picked out by a brick ornament. Some of the slightly set-back upper floors are framed by roof tiles placed vertically.